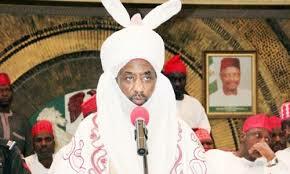 The Emir of Kano Muhammadu Sanusi II has said that financial recklessness and lack of national planning were largely responsible for the current hardship been experienced by Nigerian masses. He disclosed this on Saturday in Abuja at the 3rd annual lecture of the Zubairiyya Foundation, Abuja chapter themed: “Islamic perspective on the nation’s economic and social policy”. According to Daily Trust, Sanusi, a former governor of the Central Bank of Nigeria (CBN), said if the nation’s population is growing by 10 percent and the Gross Domestic Product (GDP) also grow at the same margin, it means there is stagnation, and that if the GDP growth is less than the population growth, then there is problem as it means that poverty is growing ahead of development. “The youths should be mobilized, trained and be made to be productive. We should give premium to planning and be financial discipline, this is like saving for the raining day,” he said. He likened Nigerian situation to the time of Prophet Yusuf (Joseph) when the Egyptians were warned by the prophet that they would experience seven years of abundance and another seven years of famine hence the need to save part of the seven years of abundance for the other period. Sanusi said that while the Egyptians listened to Yusuf, Nigerian ignore its own ‘Yusufs’ hence the present hardship facing the citizenry and therefore urged the government to partner with core professionals in its policy drives. He also faulted comparing Nigeria to Saudi Arabia and other oil producing countries, saying while a barrel of oil in Saudi Arabia is expected to cater for three Saudis, same barrel of oil is expected to cater for over 300 Nigerians. The guest speaker at the event, Shiekh Aminu Daurawa, said there is difference between good leaders and good leadership, noting that a good leader may take care of few citizens and himself but that good leadership takes care of all. He cited events during the era of Caliph Umar where employees were truthful even when their masters were not present, saying it was due to the good leadership style of Prophet Muhammad emulated by Umar.